Located in the "heart" of Arizona, the Verde Valley is ideally situated above the heat of the desert and below the cold of Arizona's high country. Surrounded by the red rocks of Sedona, Mingus Mountain elevating to 8,000' to the west, and the Mogollon Rim stretching north and east, its low elevation of 3,300' and moderate climate is enjoyed year-round. With its state parks, historic sites and enticing attractions, the Verde Valley offers activities for all ages. 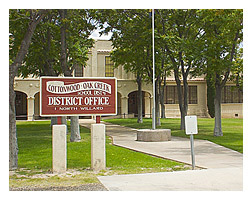 There is an assortment of hotels, RV Parks, campgrounds and restaurants to choose from, all within close proximity to the parks, attractions, wineries and Old Town Cottonwood. 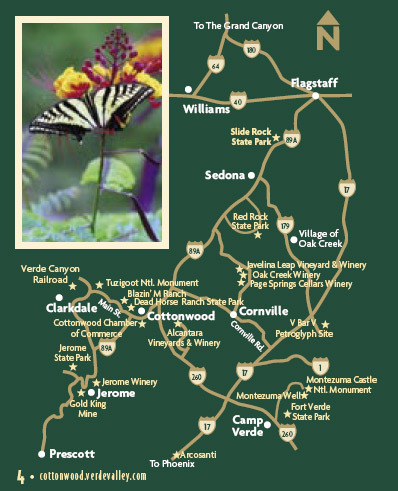 Plan to stay a few days; you will need them to see all there is throughout the Verde Valley. Ancient civilizations, with their unique history and cultures, are here to explore. More than 100 species of birds reside at Dead Horse Ranch State Park and Native American history abounds at Tuzigoot National Monument. 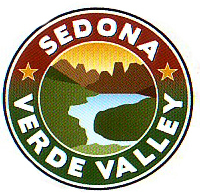 To learn even more about what there is to do and see - View Sedona Verde Valley Tourism Council site. 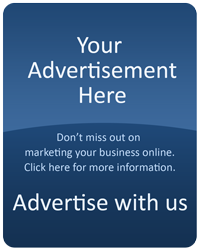 Scenic beauty and recreational opportunities will thrill the adventurer, and the many fine shops and galleries located in Old Town, Clarkdale, Camp Verde, Sedona, Cornville and Jerome will easily appeal to the shoppers. Temperatures and Precipitation, The Verde Valley’s climate is ideal for year-round visitation. Due to its low elevation of 3,300’, visitors tend to enjoy moderate climate year-round. MONTH DAILY MIN. DAILY MAX. AVG. TOTAL PREC. the Grand Canyon from here.